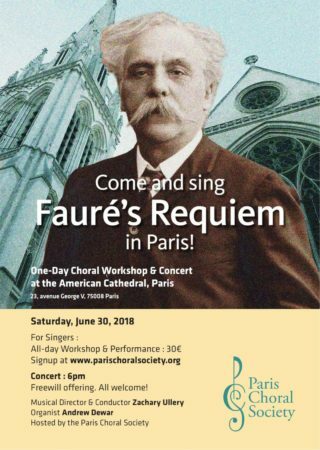 Come sing Fauré’s Requiem at the American Cathedral! * please ensure you have registered for this event (see below for details) so we can plan accordingly for numbers and voice part distribution! — For current PCS members: there is a separate process to confirm your participation for this event. Please visit the members’ section for further details. This singing day hosted by the Paris Choral Society (PCS), is being led by Zachary Ullery, Canon of Music at the American Cathedral and Music Director of the PCS. If you’ve ever seen Zach in action at a Sunday service at the cathedral, or at a PCS Messiah SingAlong, you’ll know that he is an extremely professional and fun choir director who can bring out the best in any of us! Accompaniment will be by Andrew Dewar (American Cathedral organist and PCS accompanist) and we will be joined by two professional soloists (details to be provided soon). The day will start with checkin at 9:30am, and singing will be as of 10:00am. The workshop will be all day from 10am – 5pm with mid morning & afternoon breaks, and one for lunch. Coffee/tea/ water and light snacks will be provided for the breaks but please bring your own packed lunch. Singing sessions throughout the day will end in a concert in the magnificent setting of the American Cathedral at 6pm. Participation in the workshop & concert is 30€. Workshop places are limited so register early to avoid disappointment! You must 1) register AND 2) pay ahead of time online to confirm your participation. 2) to pay, please purchase on this page (see above), by selecting the number of workshop “tickets” you would like, then proceed with the shopping cart process. but for those who do not wish to purchase one here is an out-of-copyright score (click to download) with the same measure numbers. 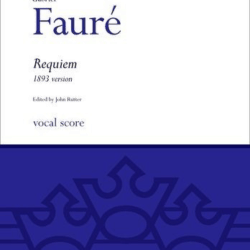 Whether you know the work well or are singing it for the first time, this is a wonderful opportunity to develop your singing skills, learn more about the Requiem, enjoy meeting other singers (including members of PCS) and experience the pleasure of singing in a large choir. A range of experience and ability is welcome, but you will need to be able to read music. Audio practice files to learn the notes before the workshop are here (click). No special concert dress required for the singers. Although audience entrance to the concert is free, they will be asked to make a donation. We will be advertising the concert in many of our usual publicity locations and make sure to tell your friends about the concert too!